"Bill had this thing about germs. He was on a mission to expose himself to as many as possible to increase the power of his immune system in preparation for the epidemic he knew was coming. This was Bill's version of a health-insurance plan. He preferred seedier places where homeless people went to clean up. Restaurants where he knew the employees didn't wash their hands. Rest stops just across state lines were his favorite, those germs were well traveled. He embraced the germs, taunted them, dared them to make him stronger, more equipped for the day when scientists would pay him handsomely just to observe him." 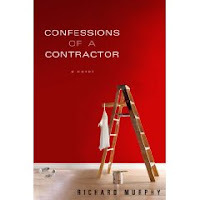 From: Confessions of a Contractor. Richard Murphy, Putnam and Sons. 2008. This is a very good read. Quick, fun, funny and unexpected. Haven't finished it yet but as of now it gets three Topiary hooves up! Wow, Sandi has a new, carefree picture! Nice! Bill turned out to be the hero of the book, surviving all germs. So it was okay. Ah... by the title of the book I thought it was going to be something along the lines of "I show up to do the job late, I lie to your face, and I charge twice as much as I originally said." The most intriguing line was the first sentence which is "Don't sleep with your contractor." It purported to be fiction but after reading it, if there are any guys out there looking for women, apparently contracting is the way to go. It was a light, fun read. I think i dated that guy. Well, slept with him anyway.